Human Skin is a remarkable organ, it is the body's largest, but it is often taken for granted. Most people are content to let skin be, until dryness, oiliness, a rash or a wrinkle raises attention. However, once they understand how skin functions, many reconsider the importance of the skin and the quality and content of the Skin Care Products they use; as well as the importance of receiving regular professionally performed Skin Care Treatments, appropriate for their skin type. The Skin Consists of two Main layers. The Epidermis, which forms the outer layer and the Dermis, which forms the inner layer and constitutes the main bulk of the skin. 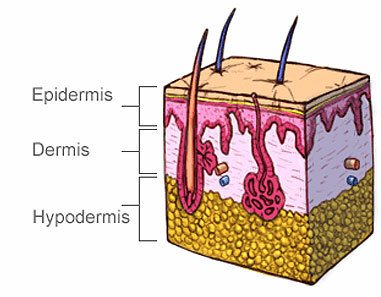 The Hypodermis (Subcutaneous) layer contains fat, which acts as insulation and helps to preserve body heat. It also acts as a cushion under the skin so providing a firm foundation. The Epidermis is composed of approximately 30 superposed layers of cells. Every day, a new generation of cells is produced by the basal layer, which means that the epidermis is entirely renewed in approximately 30 days. To coincide with the skin renewal process, The Clinic Facial Treatments have been designed so they have effective skin results lasting for at least one month. The skin's basic function is Protection. During the day, it shields against solar UV aggressions, dehydration, friction, wind and tautness after washing or use of inappropriate skin care products. Skin Care Products for the day are primarily protective moisturizing creams that strengthen tissue structures to help prevent loss of firmness. Night time is when the skin is repaired. This is when blood micro-circulation increases both the assimilation of active ingredients and cellular activity. Night time is the best time to apply a serum or cream. When the skin is relaxed and stress-free, micro-circulation brings oxygenated blood close to the surface of the skin. It adds a rosy and healthy glow to the complexion. The Clinic's treatments and products are highly specialised. They are able to penetrate into the deeper layers of the skin, therefore making them extremely effective at reversing and preventing the ageing process in the skin.